Indianapolis Mayor Joe Hogsett on Thursday announced the Housing to Recovery Fund, an initiative to bolster services for people experiencing homelessness. Through a partnership with the Central Indiana Community Foundation, or CICF, the city hopes to raise $4 million in the next two years. That money will go to providers that work to keep people in permanent supportive housing, where wraparound services help people transition into a more stable life, not transitional housing or emergency shelters. Hogsett says there has been a push for more emergency shelters in the city. He says they remain critically important, especially on cold winter nights. "But the truth is, as well-meaning and as important as shelters are, whether intentionally or not, they perpetuate homelessness," Hogsett says. "Because they are, by their very definition, temporary in nature." Hogsett says the support will also help address mental illness and substance abuse, issues that commonly intersect with chronically homeless populations. "Too many times today I hear from police officers who encounter those who are in very stressful situations, that they have two options – begin the process of incarceration or take them to an emergency room," Hogsett says. "We need to be providing permanent solutions." CICF President Brian Payne says they want to ensure people are connected with services like mental and physical health care, addiction counseling, and employment or education assistance. "All the wraparound services they need to become ultimately, we hope, self sufficient, or at least live a life in dignity," Payne says. Payne says grant money from the Housing to Recovery Fund will be awarded starting this summer. CICF will house and manage the funds. And Payne says the grants will be distributed on a performance-based model, in which providers will be held accountable through a number of benchmarks. "One of the major benchmarks is how successful they are in keeping people sustainably housed over a long period of time," Payne says. "Specifically for a year or more. We'll be measuring, has that person been successfully housed with the supportive services they need to make progress for a year or more." Chelsea Haring-Cozzi is executive director at the Coalition For Homelessness Intervention & Prevention, known as CHIP. Haring-Cozzi says the city's homeless population has been stagnant for years. CHIP's annual count typically finds 1,600 to 1,800 people. And she says it's a struggle to keep many of them housed. "Today is really a milestone," Haring-Cozzi says. "It marks a shift in the way our community invests in and measures progress. It also solidifies an approach that is vital to ensuring real change happens." Haring-Cozzi says low-barrier housing, and services for people in need of that kind of housing, is highly needed in Indianapolis. She says much of what is currently available is based on a medical model, and what can be billed to Medicaid. "So it's fairly restrictive, because there's a lot of engagement that happens with individuals to get them connected to services," Haring-Cozzi says. "It takes time. There's never been a model to figure out how to help cover the case management, and the coaching, and the peer recovery, mentorship and all of that. That is vital to getting people connected to the larger array of services." The city considers the fund an important piece of an ongoing project to end chronic homelessness by 2023. 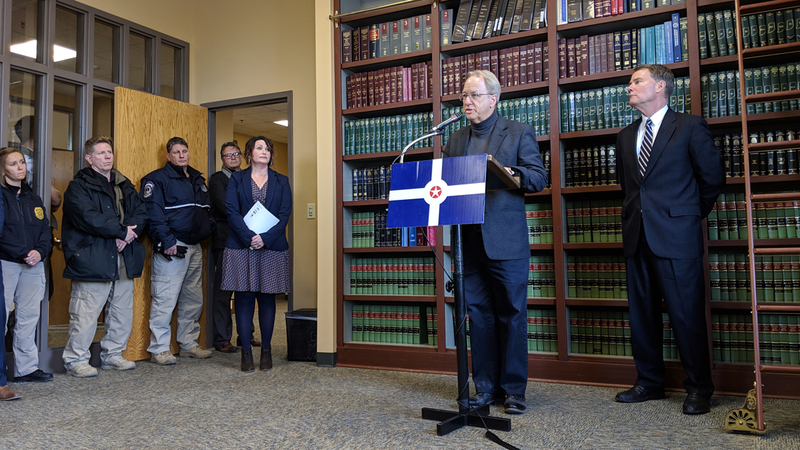 That plan, revealed in 2018, calls for 1,110 new permanent housing units, 690 new rapid rehousing subsidy slots, expanded wraparound services, unified systems that monitor homelessness, and increased funding for the Indianapolis Continuum of Care, part of a HUD program comprised of people and organizations working on homelessness.